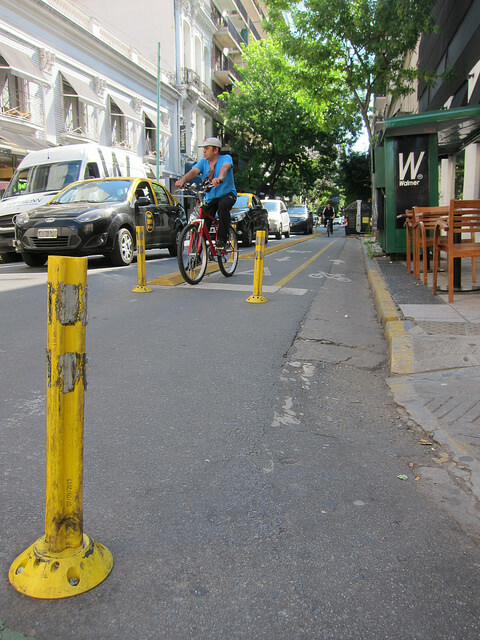 It has been some time since I last wrote for The City Fix, and I am very happy to note that São Paulo finally seems to be constructing a significant number of cycles lanes which is excellent. This week was the first time I have seen the air monitors report “pessimo” levels of air quality, and never has there been such a need for people to be switching to cycles en mass. I also saw a video on Facebook which showed a female cyclist confronting a car which had been driving along one of the new cycle lanes. Clearly in Brazil there is still some way to go before drivers start to really respect cyclists, as they do in more mature countries (and Spain deserves a special mention as a country where I have ridden on country roads and been extremely impressed with the care of drivers there for cyclists). This woman was brave, as obviously in Brazil where violence is high, the scene could have turned into something quite dangerous. In the UK, there are still encounters between angry cyclists and idiot drivers, but the greatest danger is that there will be more of a punch thrown than anything more sinister. Also in the UK, there is an excellent Youtube channel called “Silly Cyclists” hosted by a cyclist called Gaz, which shows the top 10 videos of the most reckless and silly riding caught on head-cams each month. In the UK we still have some way to go before all cyclists manage to ride and share the roads with the same level of respect that we would hope other motorists have for us cyclists. 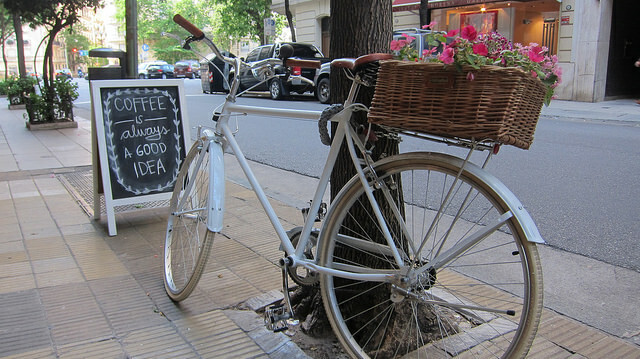 This week I have been in Buenos Aires, and while walking along the streets near my hotel I did notice a couple of very nice design details relating to bicycles here. 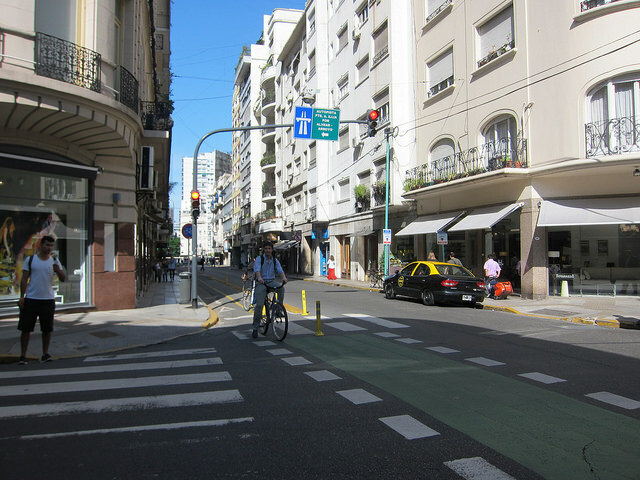 The first is this junction in which you can see the cycle lane. This is a two way lane, for cyclists riding in both directions, and as you can see there is a raised protective strip to stop vehicles making incursions into the lane which is great. What I also noticed was this single bollard some distance to the front of where the cycles have to stop. I really liked this detail in the design of this junction, since this single bollard forces cars which are turning right or left to steer clear of the stationary cycles, giving them further protection. This is a small detail, but one that I think really works well and which other city designers would do well to study as I have not seen this elsewhere. And one other detail I discovered was delightful. While walking past a cycle shop called Canaglia Bicicletas, which at the time was closed, I noticed a woman filling her front tyre with air. The cycle shop had provided an air pump for anyone to use. 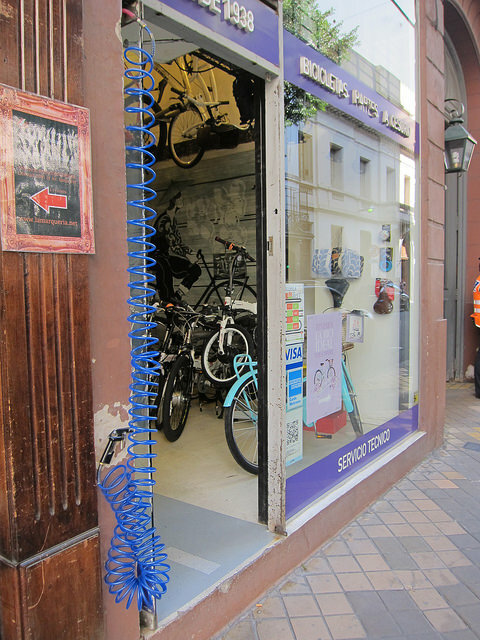 This helps cyclists who may not have brought a pump with them, and it obviously attracts cyclists to the shop even if they do not need anything at that particular moment, so everyone one wins. As cycling in São Paulo and elsewhere in Brazil continues to become more popular, I hope these little details inspire others to think what extra facilities they could offer people. These little details can make a huge difference, and so we always need to be inspiring each other, in order that we can live in cities where we can all have good fresh air to inspire, including our bikes.